It's a bit of a tricky one then, isn't it. They look good to me mine seem to have faded a bit. Yeah mine too, so I went looking for replacements, nothing doing RCZ wise and thought these look quite nice. Where did you come by these then? Cheap and cheerful - just right for a Yorkshireman !! I need to replace my RCZ puddle lights as they have gone watery! I would like them again. I hear you all loud and clear about the 'RCZ' and 'R' door courtesy lights. I have been looking for another manufacturer for a while now and still looking. As soon as I have found a new supplier I will let everyone know. Those that have them and noticed any fading etc. to the light, this is common with these types of lights including the Peugeot symbol ones others have bought as the image is provided via a thin piece of plastic and over time this fails. Other courtesy lights that you may come across that require drilling into the door last much much longer as they use a piece of glass for the image. So not just am I looking for a new manufacturer for the 'RCZ' and 'R' lights, I want to make sure they last longer than the previous units. Is it not possible to have the image in a piece of glass that is inserted into either a dedicated replacement fitting or can be inserted into existing standard fitting? Or will the glass and plastic have a blurring effect? I have tried using a piece of glass in a dedicated replacement unit, but the glass is thicker and so it does not stay in place and the output is blurry. So this would mean the unit needs to be modified, something that I am wanting to avoid and unfortunately a manufacturer will not unless you are about to order thousands of units from them for it to be worth while in regards to cost. I removed the plastic inserts from mine as they had started to look very Much like a Picasso work. I now have a large round led glow on opening the doors. I had wondered how to replace the very tiny plastic insert with one showing the RCZ logo, but I wouldn’t have the first idea how to go about this. I had thought about the cheap ones from Fleabay showing a Pug logo of some sort or another, but they didn’t really appeal to me. If RCZ ones become available again, I would like to get them back to full glory again, but it would be nice if they could last a bit longer next time. The image has to be transferred onto that thin piece of plastic and that takes a special tool to do this. And yes my goal is to provide these again with a longer life. I bought some the other day with the Pug logo on for £11.00 and they look pretty good. Bonus was it took less than a minute per side to fit them. I would however consider RCZ one's if they became available at an equally reasonable price. Working on it now with a new manufacturer. Stay tuned! Sounds good, would love a set for my RCZ R if/when they are available again! 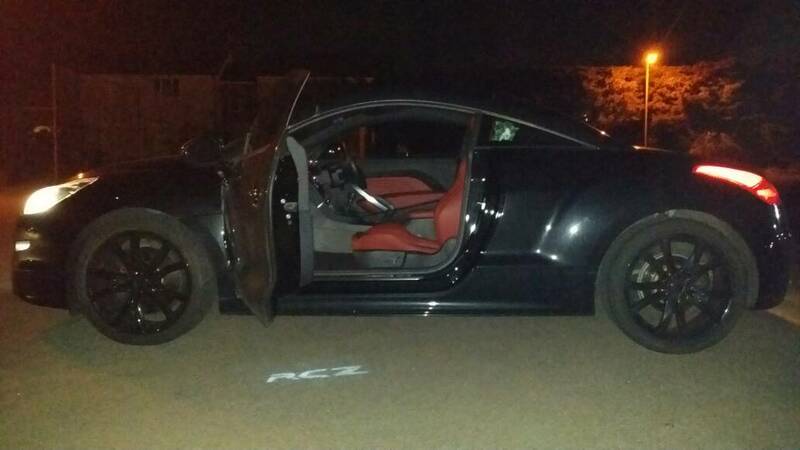 Former owner of a black 64 plate Peugeot RCZ R, and a charcoal metallic 12 plate RCZ 200GT. 'RCZ' ones in July !!! What is price going to be? Are the RCZ ones just letters (like my picture above) or do they have the circle around them? Yay! Will they be longer lasting glass ones? Unfortunately they are not glass. The only way to have the glass ones made was using the type of courtesy lights that you need to drill a hole into the door for mounting as these types can accommodate the thickness of the glass, and this type of 'universal' door courtesy light is not the type I want to sell (I do not want to sell ones that need drilling). So we are using the same type of unit as before which as you know are simple PnP design not requiring any drilling and using a film, the same film found in all of the units found online which do have a shorter life span than glass. But these units will have a 12-month warranty so that is good. I am just finalizing the last detail and then placing an order. Maybe you could negotiate a replacement film price too? That way we could buy a set of lights along with a replacement film (or 2) for when the inevitable happens? It is very simple to remove/replace the film in the light unit, I took my dodgy ones out to leave a round LED light which was preferable to the Picasso I had been left with.